Consumers around the world spend an average of 463 minutes or over 7.5 hours per day with media. American consumers tend to average more time than most, as media is a major part of their daily lives. 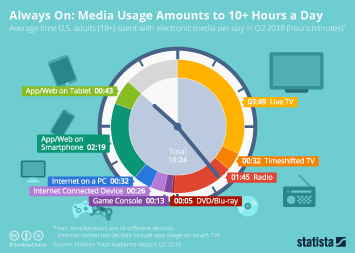 Although the ways in which media is consumed are changing, Americans still spend around 369 minutes per day with traditional media, along with 363 minutes of digital media. Nearly 120 million U.S. households have TVs, with the largest local television markets being New York, Los Angeles, and Chicago. In fact, the weekly reach of TV in the U.S. is a massive 88 percent among all adults. Some of the leading networks are NBC, CBS, ABC, and FOX, which bring in millions of viewers and account for a significant portion of the information that U.S. consumers are presented with each day. The most popular viewing genres are sports and news, with NFL Football being particularly popular. About 93 percent of American consumers listen to the radio at least once a week. This share is slightly higher amongst Americans aged between 35 and 49. Men aged 35 to 64 spend the most time listening to the radio (around 16 hours per week), whereas teenage boys spent the least amount of time (around 7 hours per week). Talk radio has seen growth recently while many other genres have experienced large declines in listeners. The amount of time spent on traditional media has been falling for years as consumers make the transition to digital media formats. Circulation of paid daily newspapers has more than halved since 1990, and many newspapers are beginning to try their hand in the digital market. Only around 15 percent of the U.S. population reads printed newspapers on a daily basis, while 26 percent of consumers don’t read printed newspapers at all. The magazine industry is facing similar challenges to those of the newspaper industry; more and more consumers are interested in web based magazine content as opposed to print. One of bright spots for traditional media is the book industry. Although various new technologies such as audiobooks and ebooks have added diversity to the market, the majority of consumers still much prefer traditional paperback books. Internet has experienced massively increasing reach and influence over the past 15 years, with household penetration rate growing from around 55 percent in 2003 to around 84 percent today. Around 211 million Americans use social networking sites, many of which have become their hub for finding news, media, and entertainment. With the rise of the internet, gaming has become even more popular, partially due to the increasing ability of video gaming to serve as form of social interaction. Over 200 million Americans use digital games as of 2018, and console gamers averaging over 28 hours of game time per month.